A luncheon conversation about boats revealed a common interest in long-range cruising with a new acquaintance of mine – Tom. Following a pleasant conversation Tom graciously invited me out to see his Krogen, docked behind he and his wife Nancy’s beautiful condo nestled between Florida’s Intracoastal waterway and the Atlantic ocean. I knew in my mind what the Krogen line was symbolic for and when I caught my first glimpse of Tom’s 42 it was immediately apparent what draw’s so many boater’s to what has become known as the ‘trawler’ – the distinctive sheer line, the sea-kindly displacement hull, and her raised pilot house configuration. When stepping aboard, you can sense the genuine pride in ownership that Tom felt about his boat. Most yachtsmen I’ve met are ‘hands-on’ people who enjoy describing the custom touches or improvements they’ve made along the way that make their cruising experience that much more enjoyable. 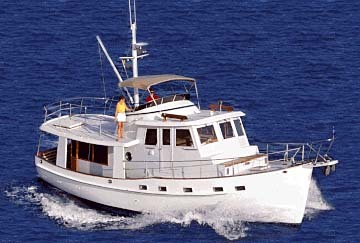 Tom was no different as he described the added features and various changes made aboard since taking ownership. “She has a ‘salty’ character about her.”, Tom explained, as he shared some of his cruising stories with me. While the boating industry has been seemingly taken over by ultra-contemporary styling these days (a revered former employer of mine once described them as ‘Clorox bottles with windows’), it’s truly a breath of fresh air to reacquaint myself with a true classic. From the boats elegant lines, the bronze hardware, it’s polished teak, to its’ cruising-friendly layout, this Krogen 42 brought a smile to this designer’s face.